Pico Blvd. Safari, originally uploaded by savemejebus. Michelle Shocked once sang that you can travel for miles and never leave L.A. That wasn't quite the case yesterday when dozens of Angelenos set off by foot to traverse the entire span of Pico Boulevard from Central Ave. in downtown to Ocean Way in Santa Monica. We didn't quite stay within L.A. city limits, but she does have a point. There's so much of this city to see that even a lifetime lived here cannot guarantee a complete understanding of the city, and this fact was apparent as I made my way down one street in this city. To be fair, I didn't quite walk the entirety of Pico. I got to downtown late and met up with the rest of the walkers at the Garment District, but I promise to make up what I missed some other time. I'm tempted to describe the Great LA Walk in poetic terms as a triumph of the human spirit type of ordeal. It wasn't--at least for me. However, what it did do for me was remind me that there are innumerable wonderful people who make up this city who truly and proudly call themselves Angelenos. An event like this attracts the city's cream of the crop. I didn't get an opportuntity to talk to everyone, but I'm grateful for those I got a chance to speak with during the hours spent walking. I just got back from seeing Before the Devil Knows You're Dead at the Westside Pavilion. On the way home I took Pico down to La Brea. It's a street I haven't regarded very much, but after yesterday's walk it feels reassuringly familiar. 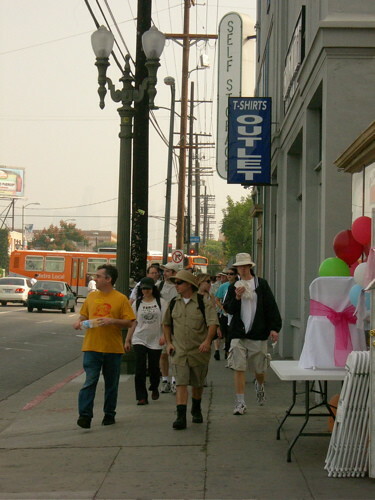 Thanks again to Franklin Avenue for organizing the Walk. I look forward to doing it again next year. More pictures from the Walk at my Flickr page. Nice Job, Raul. I understand there's a walking group that does a simular trek. They're very snooty... they walk down Olympic Blvd. Covered: "Always On My Mind"